Strawberry Milk: a blog for fabulously fashioned fetes. 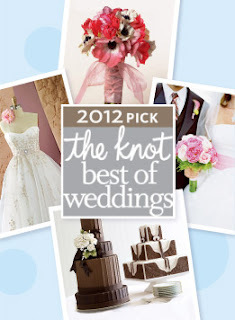 : "Best Of" Weddings 2012 Winner at The Knot! I’m so happy to report that Strawberry Milk is the recipient of The Knot’s "Best of" Weddings award for 2012! This is very much a "people's choice" award and we cannot thank our clients enough for all of the awesome reviews and kind words. I feel so incredibly blessed to be able to do what I love on a daily basis, working with amazing couples and helping to make their wedding dreams a reality. What a great Thanksgiving gift! The Knot will officially announce all of the best of winners on their site January 23, 2012.